I’ve been avoiding penning this topic to my blog mainly because I have no idea how or where to begin unpacking it. It feels like a mental and emotional pile of laundry that just keeps growing taller because you’re too busy or tired to start in on it. And honestly, who wants to do laundry anyway? Let’s be real. But part of me feels like if I don’t get this cleaned up and ironed out, I will just keep wallowing in it. I dipped my toe in the water with a brief series about postpartum depression on my instagram stories one day not long ago, because it felt good to reveal my truth and I wanted to reach out into the universe to try and touch something with it. Almost like touching your hand to a cold window; somehow you must confront what you know to be there. To feel it interact with you in some way. So I shared a small testimony of where I was, and the ping back I got from many of my friends was truly warm for me personally, but also telling of the nature of motherhood. And I’ve been chewing on it ever since. The truth is, I have yet to meet a Mom who has not, in some way, suffered from a whif, a bout, a blip, or a season of postpartum depression or anxiety and/or feelings of rage. Not one. If you are a Mom and you haven’t had this settle on you in some way, that’s spectacular! I’m monumentally happy for you, because it’s a true adversary. 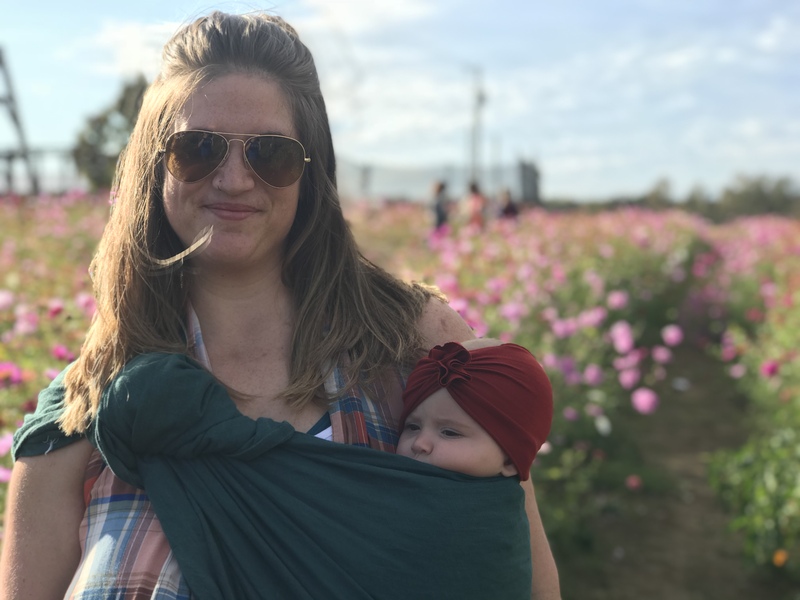 I’ve been at this Mom stuff for just six months, and when I leaf back through all of what that time has brought me, it’s hard to pinpoint when exactly it started, but I would venture to say around two months in. But honestly, I just attributed it to bad days. I was tired, impatient, new to all of this. People can have bad days! That’s when the sleep deprivation began to really grind me down, and I would have moments of consuming rage when my mind would cut loose in a really horrifying way. Always abrupt, always short lived, and always triggered in the same way; my child is not sleeping when I want/need her to sleep. Regret would immediately follow and I would wonder what the hell just happened to me? And then I would shove it as far away as possible and consider it a terrible, temporary flare up that would probably go away very soon. But, it didn’t. And then I began losing interest and motivation in doing things that previously brought me balance and happiness. And when you lose the antidote that always worked before, you feel pretty hopeless. A few weeks ago, Rob sat me down and made me confront what I had been trying to repress. He called it by it’s name, depression, and met me where I was with more understanding and unconditional love than I felt like I deserved in that moment. Ordinarily, I would have wiggled out from underneath his words, reassuring him that I was fine and just tired, and apologize for whatever I had said or done that was out of character. But this time, it was different. I felt so far away from where I wanted to be and I could not see a way to get moving. He got my attention and urged me to try to identify whatever it was that was that was triggering my episodes and eliminate it. That was my first homework assignment. What was my trigger? When Ellie was a newborn, I started recording everything. Data is so important in those first few weeks. Nursing, diapers, sleep, rinse and repeat. Track all of it, so you can obsess over how much or how little something was compared to what it should be (or just report back to your pediatrician when they asked questions). It became just part of the routine, and I did it for 24 weeks. Not only did it keep me connected to my phone more than I ever wanted to be, but it also began to haunt me. It was something else to do, something else that required upkeep. And the one data point that I let lord over me was hours of sleep. So I deleted the app, and in that instant found healing and freedom! I did not get a unicorn baby. I got a baby whose sleep habits and behaviors are always changing, and somehow, always feel as though they are regressing. But I’m not going to spend a lot of time drilling into this, because frankly, it doesn’t matter to you. And Ellie is so much more than her sleep (or lack of it currently). What I want to communicate is that…being a Mom is different than being anything else. I’ve said this before, but it’s a true heaviness. And occasionally you can get out from underneath the weight and breathe and feel truly wonderful, but before too long, you put it back on because you have no other choice. This is at least what motherhood is for me right now. Some days, I let the weight of it keep me still and sad. I look around and see places I want to get to, but simply can’t muster the strength to move past where I am. And on those days, I just bear the weight and do my best to live on, because if I acknowledge that it’s there (out of some gesture of morbid respect maybe) it will move past and tomorrow I’ll have the extra energy to see around it or to push it aside entirely and feel joy. That’s always my hope at least. It feels incomplete to write all of this and share it without having something else to offer you, or offer myself. But the truth is, I’m not sure what’s next. I wish I had more solutions to share, but I don’t. I’ve had a major breakthrough, and am feeling SO much better now, but still struggle and still feel the grip of depression on certain days. Even now, as I’m writing this, I’m unsure of what I really want to accomplish with it. It’s certainly not to self-validate my journey; I get validation from where I’ve walked and where I’m going every time I hold my baby and see her do something extraordinary that she couldn’t do before. My journey is NOT in vain, nor is it a banner that I’m waving around while marching down the street. And it’s not for pity; motherhood begs for your (yes YOU) empathy and patience, but not pity. We knew the rules before playing the game. I guess what I’m searching for is catharsis, and hoping that I can connect with someone else in a similar place. If I must endure what I believe to be episodic depression connected to my role as a Mother, then I want it to be out loud. If I am to suffer, even in small doses, I want it to be out in the open for everyone to see because that’s the only place healing can occur. We must offer a flower sunlight in order for it to bloom. We must open the door and step outside, into the big wide open, in order to see the goodness that exists beyond our darkest selves. The other night, after Ellie had woken me up for the third time for a comfort only I can provide, I cried. I cried while nursing her back to sleep, I cried as I crawled back into bed just a few minutes shy of when I had to be up anyway. I just cried because it felt good to cry. In that moment, I wanted to flee; I guess because the mind looks for the path of least resistance when we are weak. Rob laid his hand on my back, and I felt more tired and defeated than I had in awhile. Later that day though, I had one of the best days I’ve ever had with my daughter. She was delightful in literally every way, and brought me more peace and joy than any day I could remember lately. And I realize now, that it’s okay that there are two sides of a coin; that these two competing places in my brain can somehow coexist and that for now, I am okay with that. Because the coin will always flip back over. So when it’s a bad day, and I feel stuck and heavy, I know in my heart that it won’t be this way forever (even though sometimes I need Rob to remind me). I know in my heart that there are bigger reasons for all of this, and that my journey as a Mother won’t always be easy, but it will always be worth it. It will always matter, and it will always change, flip sides, and roll on. And who knows, maybe I will go to bed tonight and Babette won’t wake up until the morning. We could be at the home stretch of all of this and I just don’t know it. Likely not, but maybe! One day she will sleep longer. One day I will sleep longer. I know that everything will be just fine even though it may not FEEL that way right now. My hope for you, if you feel any connection to any of this, is that you learn and come to know these things too. And that if you are suffering, in ways big or small, I encourage you to suffer out loud alongside me. I want you to know I think of you. I think of you every time I get up in the late night or early morning and sit in her nursery with blurry eyes and a tired heart. I picture you somewhere close by doing something similar, and I don’t feel so lonely anymore, and that is good enough. I feel connected to you, and I hope somewhere you feel connected to me too. Previous It’s Finally Fall Y’all! A mutual friend shared your words with me, and I cannot thank you enough for writing them. For saying them out loud, putting into words the feelings that have plagued me over the last year as I started my journey in motherhood. Bless you. You are certainly welcome Mama friend. I vividly remember thinking during the first 3 month blur “I don’t know how to live with her, but I also don’t know how to live without her.” It’s a strange new world. Hang in there, and keep on keeping on. ❤ Solidarity!